Je ne pas encore eu le temps de tester. After such a long while it's finally here! You don't even need any extra software/modification to run it! 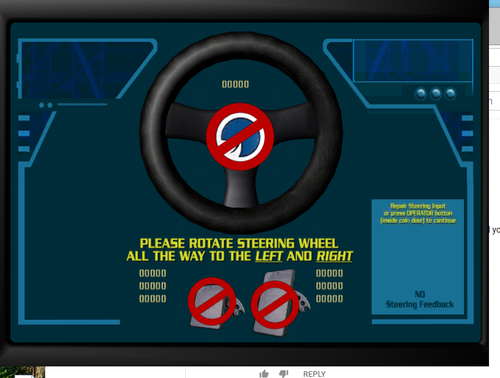 The car/track selection screen is fully functional! NOTE: The content of "_Codec" and "_DotNet" are optional for a regular, recommended for Virtual Machine users! For the best experience, set screen resolution to 800x600 before starting UniverShell2.exe! Anyway to avoid the flickering/grey objects (from the YT video)? Just gave it a shot. Can't get passed this. Followed the instructions precisely. What exactly is wheel and pedals mapped to? maps top joystick apparently keyboards work i got press key x to start then select level etc then get a fail to start corrupted files or regestry msg . I had a xbox controller active. Didn't pick it up. Works with Win 10 natively + xbox one controller? Pressing O takes you to Operator menu. Keyboard u/d/l/r/ mapped to things in there. S is Start. Don't press \ EVER on that cali screen. Break everything and then you need to recopy over files. Else upon launch you'll see a Press Start screen followed by crash forever. I was able to enter the game menu but I could not configure the controls. What to do? that is useless coz you cant save any changes. New regedit files fixed the issues with loading gameplay for x64 users. I still can't get 1.1 to work at all, nor the widescreen exe that the dude above provided. 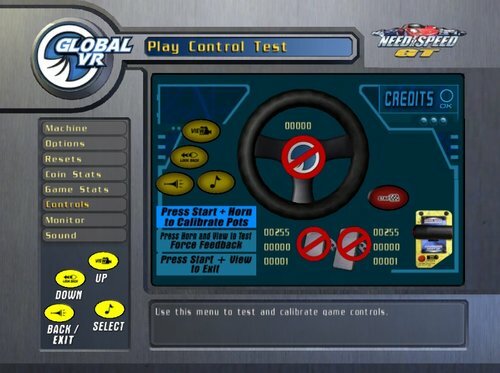 So I played with this software in a NFS GT arcade cabinet. I have the custom USB I/O board (Nytric board) and the I/O works 100%. I have the same issue as others with crashing due to bad registry (need to try the recent fix). If someone could configure Universal Control Remapper to recognize (and port the) inputs we may have a solution for analog inputs.